For years, you’ve probably been taught to send thank you letters for gifts. Whether or not you listened is up to you – but when it comes to making sure your nonprofit or charity properly thanks your donors, you shouldn’t skip out! It’s pretty simple: According to research, 65% of first-time donors don’t make a second gift – and 80% of those donors say a simple “thank you” would convince them to make a second donation. 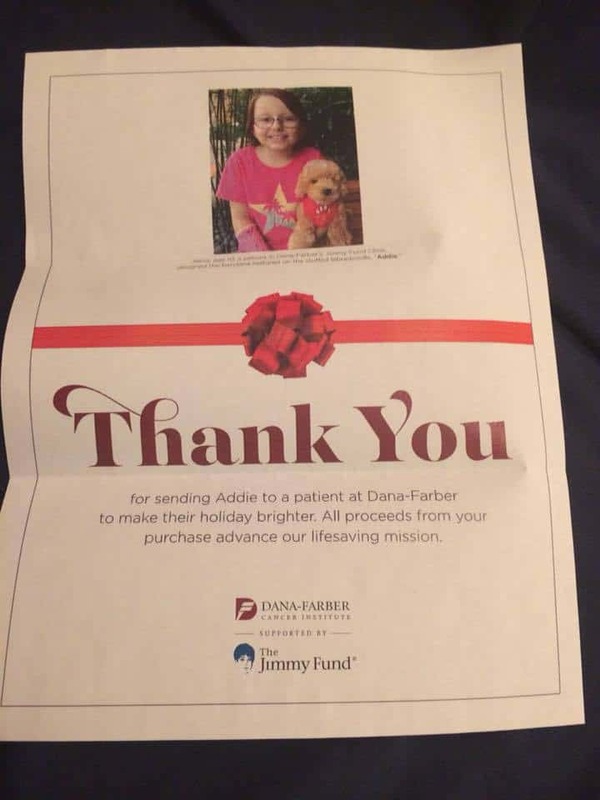 That’s proof that something as easy as a thank you letter can bring in extra funds for your charity or nonprofit. Crafting a good thank you letter for donation isn’t just about encouraging more giving – it’s a necessity that can help make your donors feel like they’re a part of something bigger. Put yourself in their shoes: Imagine you’ve donated even a small amount to a cause you care about. What will make you feel more appreciated: Never hearing anything from the cause (or worse, a “Dear Friend” form letter) or a personalized, well-written thank you letter that frames your donation in a larger context and helps you feel like your support can make a difference? We thought so. But where do you start when it comes with putting together the best letter of gratitude that your donors have ever read? Here’s 20 ideas for how to make your donation thank you letters really make an impact – and hopefully create more lifelong donors. 1. Make it personal: The biggest advice we could ever give is to personalize, personalize, personalize! 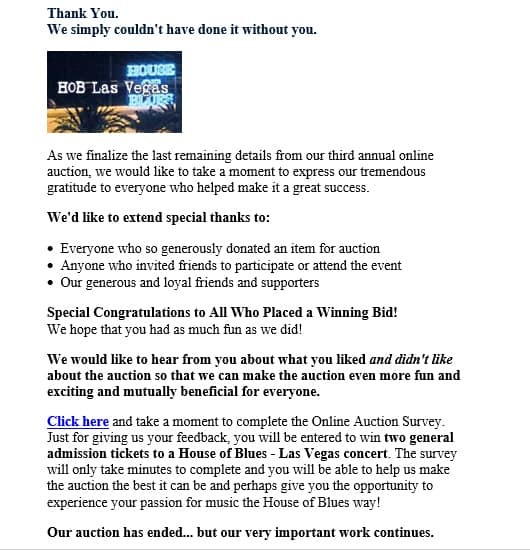 The “dear supporter” form letter is a surefire way to make sure your donors don’t feel special at all. Once you have their name and donation details, make a point to talk to them like you would talk to a good friend. This will definitely help them feel like they’re one in a million, not just one in another line of faceless donors. 2. Demonstrate the impact: This is where your storytelling skills come into play. Outline the projects and missions that the donation is going to support, and emphasize that this donation is helping to create a positive impact. Wording like “Your gift makes it possible to...” is key. 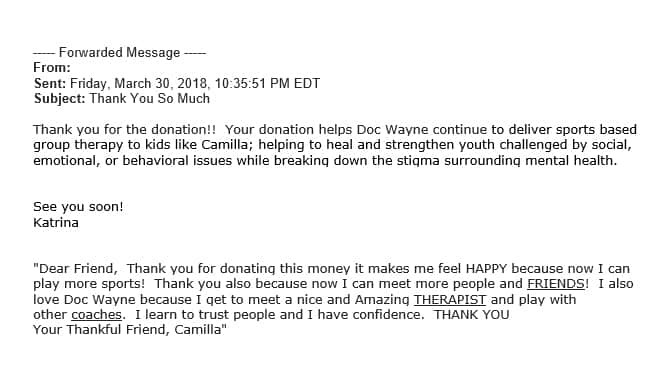 Check out the below example from Doc Wayne Youth Services – they even include a thank you from one of the kids that will benefit from the funds. This is a great way to prove that donations have impact! 3. Keep the tax receipt separate: The tax receipt email (or attachment) is a statement verifying the donation details, and some nonprofits or charities will send it along with the thank you letter. Unfortunately, this can come off as a little stiff and formal, so keep the tax details separate and fill the thank you letter with your organization’s personality instead! The last thing you’ll want is for your supporters to think your nonprofit is only focused on business. 4. Spread it on social: Ask your donors to share their donation on social sites like Twitter and Facebook (and follow your organization there too!). You can make it easy by including social share options on the thank you landing page as well. People will love to show off the good causes they’re supporting, whether it’s through a tweet that can be sent out automatically, a special photo filter on Facebook, or a fun picture they can share on their Instagram accounts. 5. Know your tone: You’ll need to craft the writing of your thank you letter to best suit which individual is receiving it. Consult your donor personas to see how they would best respond to different tones of writing. For example, you might not want to send the same letter to a youth volunteer that you’d be sending to a major corporate donor. Have your donor persona guide handy when you’re crafting the language in your letter and you’ll be sure to hit the mark, whether you need something more straightforward or more lighthearted. 6. Sign it personally: Again, don’t have this look like a form letter that’s pumped off of a conveyor belt. It’ll go a long way towards legitimizing your letter – and your organization – if the thank you is signed by a single person rather than the charity at large. You’ll want to aim high – it looks especially impressive if a director or CEO of the company signs the letters. This will just go to show that your organization takes its donors seriously, and that you place high importance on being grateful for the support. 7. Have your thank you letter team in place: Not sure who’s going to be signing that letter? Be certain to outline the process ahead of time – you won’t want to be left fumbling to find someone or worse, letting the thank you letter go unsent because it ended up on somebody’s to-do list. It’s also a good time-saving idea to have your thank you letter drafted and approved before your first donor meeting – that way you will be able to send it quickly after the excitement of receiving your first major gift! 9. Create a video message: Online video is a cost-effective and popular medium. Your staff members just need a smartphone or a laptop to create a direct, moving and authentic “thank you” video. Try doing custom videos where your staff directly address donors and express their gratitude (in either a heartfelt or funny way, or both!). You could even experiment with Instagram or Snapchat to create short messages that can be shared across social media. 11. Be specific: Donors are hungry for personalized details about the impact of your work. Are you careful to segment your donors by the types of funds and programs they contributed towards? If donors gave to a specific program, they should receive special information about their impact on that program, not just in general. By segmenting your thank you letter content down towards what really matters to your individual donors, you’ll guarantee more attention gets paid to what matters. 12. Tell a story: Your donor thank you letter is a great way to engage in creative storytelling. 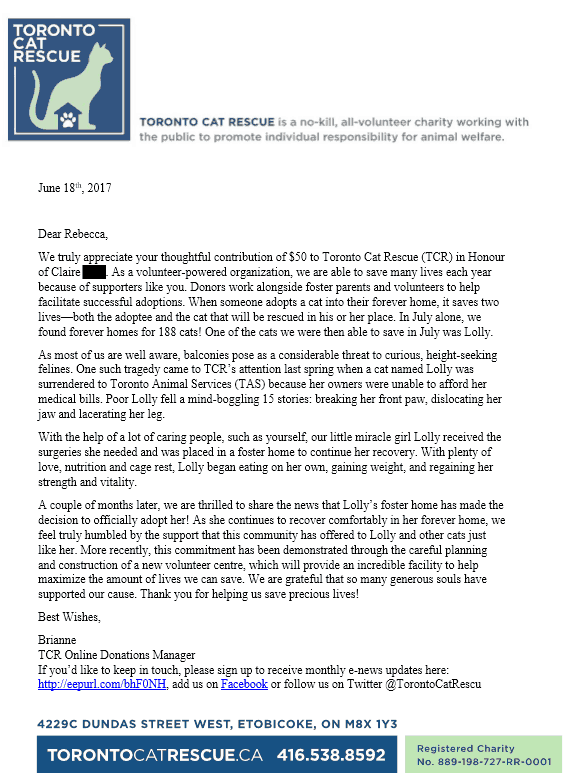 Take note of the below thank you letter from Toronto Cat Rescue: it explains how the funds will be put to use, tells a story of a particular foster cat and how the nonprofit was able to help her, and reinforces how donations further the cause. The charity even encourages the reader to follow their social media accounts – a best practice we’ve noted, for good reason! 13. Share even small progress: Show your donors they matter, no matter the size of their donation. Make sure to explain exactly how your donor’s gift is causing positive change and helping to advance your cause, even if they only gave the minimal option – it’s important to emphasize that any little bit helps (and who knows, their second donation could be even larger). Let your donors see how their donation is helping by visualizing your data in an infographic or colorful chart to help reinforce the impact of their support. 14. Add an invitation: Have you thought about inviting your donors to join you or support you in a way that doesn’t include asking for another donation? Ask your supporters to volunteer, sign a petition, come to a free event, or follow you on social media. 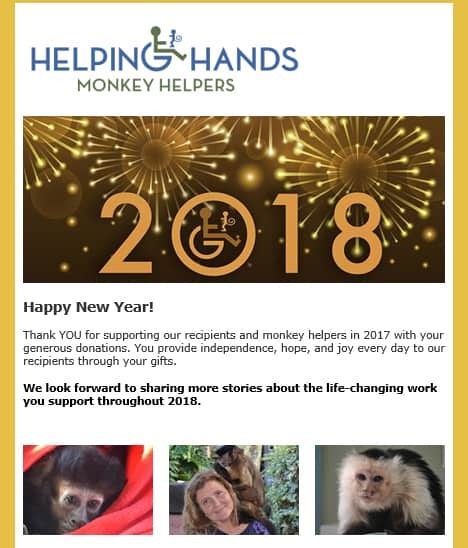 Take a look at this example from Helping Hands Monkey College – it’s a straightforward thank you without an ask for another donation. Sometimes it’s good to just show your gratitude without asking for more! 15. Consider a return envelope: If you’re sending a physical letter, make it easy to give another gift by including a reply form and reply envelope. Mention that “your future gift will continue to make a difference in supporting...” so the donor knows what their second contribution will go towards. You can also offer a newsletter subscription or other non-monetary reason to return the card. 17. Show photos of your success: Your donors love to see photos that celebrate your successes, especially if they can feel like they contributed. Photos help create a connection between your nonprofit and your donors. In your thank you letter, consider sharing photos of the people your organization has helped, or pictures from a volunteering event. These visuals are important to help add color to your cause story, plus they can really brighten up a letter format. 18. 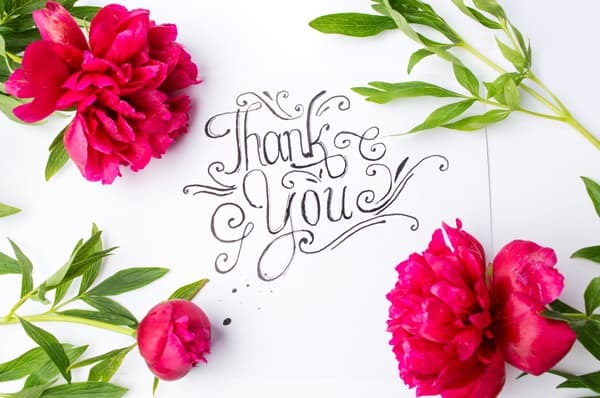 Send something more than a letter: When it comes to digital letters, a “thank you” message doesn’t have to stick to the traditional letter format – especially when there’s so much selection out there. There are several apps available that allow you to create and send a personalized postcard with a photo. Try sending a photo postcard that visually captures the everyday work you do, or see if you can put together a small animation that will show off how creative and dynamic your charity is. 19. Customize it: Be sure to choose online fundraising software that lets you use specific customization on behalf of your nonprofit (logos, design, and so on). This will help your letter stand out and maybe even earn a place of honor on an office fridge or cubicle wall! Take a look at this thank you letter from Guide Dogs of America and see how they’ve formatted it with their logo and adorable photos of puppies – that’s definitely the kind of design that will get plenty of eyeballs on it. 20. Ask volunteers to help: Harness the power of volunteers to improve your thank you process! Ask your volunteers to join staff in writing hand-written and personalized thank you notes to donors. Having the physical thank you letter be written by hand is a powerful and thoughtful way to follow up with your supporters – it shows that you’re devoted to your supporters and are willing to put in extra effort to make them feel appreciated. Hopefully this list of tips will get you and your charity started towards thank you letter success. There's no wrong way to thank a donor - but there are plenty of ways to go above and beyond. Try out some of our tips and see if you can turn a one-time donor into a repeat supporter!